So yeah. I've been remiss. One post in one year? Ridiculous. That's my bad. There are lots of excuses I could make, but they all come down to the fact that I have a hard time prioritizing myself and my writing and I need to work on that. Which is why it's lucky that I have a new adventure to go on, and I feel inspired to write about it. And I'd really like it if you came with, at least in the metaphorical sense of, you know, reading what I write. See, in just under two weeks, I'm going to Asunción, Paraguay, where I will spend the better part of a month teaching a course on Literature & Film. There's a lot here for me to worry about, and brothers and sisters, I am a world-class worrier. For starters, I don't speak Spanish, and I sure don't speak Guarani, the indigenous language of Paraguay that, I am told, peppers the speech of the people I will soon be meeting. For another, I've never taught a course on film, or literature, for that matter. And let's not lose sight of the fact that I'm going all alone, to another hemisphere, farther away from home than I've ever been. But what the hell. I'm a big girl. And I have decided to focus on what's awesome: I am going, all alone, to another hemisphere, farther away from home than I've ever been, to do my favorite thing in all the world: teach. How cool is that? Pretty damn cool, that's how. That last one is where my long-neglected blog comes in. It's all well and good to write for yourself, but like I tell my students, the fun don't stop there. If you're interested in my experiences, follow along. If you have any advice, share it. 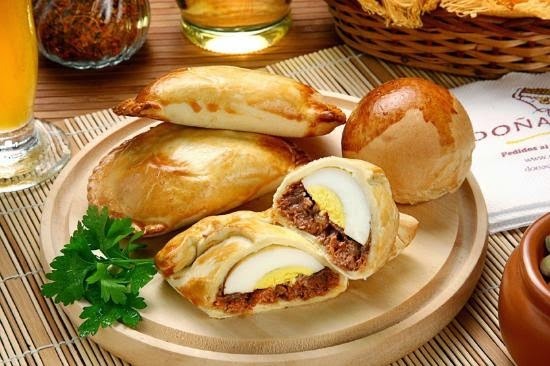 And if you'd like to look at about a thousand pictures of empanadas, I think you'll be very happy here. Seriously, I love those things.